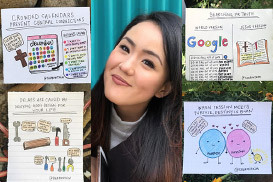 Featured Contributor Fr. Dr. John Chryssavgis on how Ecumenical Patriarch Bartholomew has advanced the perennial values of an Orthodox spiritual worldview in his 25 years of service. In May 2014, the world was surprised to see Patriarch Bartholomew, the leader of the Orthodox Christian world, standing beside Pope Francis to co-host Israeli president Shimon Peres and Palestinian president Mahmoud Abbas for a peace summit in Rome. Then, in April 2016, Patriarch Bartholomew and Pope Francis were again at the center of the world’s attention when they visited the Greek island of Lesvos in a gesture of compassion toward refugees from the Middle East and censure against the world’s indifference. These two remarkable leaders have enjoyed a close relationship since Patriarch Bartholomew made history by attending the inaugural mass of Pope Francis in March 2013. Never before had a patriarch or pope appeared at either’s enthronement in Christianity’s 2,000 years. Bartholomew is neither a head-of-state nor a political leader; he is not a pontiff with absolute or infallible authority. He is a spiritual figure, responsible for facilitating unity and presiding over assemblies of the many independent Orthodox Churches. Yet, Bartholomew has transformed the relative political weakness of his office into an exceptional strength, staking out a compelling spiritual vision and coherent moral voice in a world that longs for authenticity and stability. Thus, he has proved a faithful apologist for the ancient teachings of the early church and a striking advocate of the extraordinary liturgy of the eastern church. At the same time, however, he has opened pathways and built bridges for his ancient church to the modern world in a groundbreaking manner, literally bringing – sometimes seemingly dragging – the Orthodox Church into the twenty-first century. The most striking example of this was demonstrated this past summer when Bartholomew convened the Holy and Great Council of the Orthodox Church on the island of Crete, the first-ever such council in over 1,000 years. It was an extraordinarily successful initiative – albeit not without monumental resistance and last-minute backpedaling – to bring to fruition an almost endless struggle over decades to unglue the Orthodox Churches from their nationalistic narrow-mindedness and irrelevant introversion. The patriarch’s tenure accurately reflects the story of the Ecumenical Patriarchate through the centuries. British scholar Sir Steven Runciman liked to emphasize that the great achievement of the patriarchate was that, despite humiliation and disdain, the Orthodox Church endured and continues to endure as an immense and vital spiritual force throughout the world. and even the fact that his church in Constantinople (today’s Istanbul) has survived endless oppression over its 1,700-year history and today thrives as a nervous minority in an overwhelmingly Muslim nation . . .
All of this gives Bartholomew an unprecedented platform and unique space to advance the perennial values of an Orthodox spiritual worldview, advocating for interfaith dialogue in a time of cultural division and global insecurity, for religious freedom and human rights in a world where these are rampantly trampled or guiltlessly denied, and for ecological awareness and justice or fairness in societies of relentless consumerism and greed. So when Pope Francis released his environmental letter, Laudato Si’ (“Praise be to You”), in June 2015, it was hardly surprising that he singled out the pioneering work of the ecumenical patriarch: “Patriarch Bartholomew asks us to replace consumption with sacrifice, greed with generosity, wastefulness with a spirit of sharing.” (Paragraph 9) Consistently proclaiming the primacy of spiritual values in determining environmental ethics, Bartholomew has rightly earned the title “Green Patriarch”—originally coined and publicized by the media in 1996, but ceremoniously formalized in the White House in 1997 by Al Gore, Vice President of the United States. It was precisely for this courageous leadership in “defining environmentalism as a spiritual responsibility” that Time magazine named him among the 100 most influential people in the world. Bartholomew has done the same in countless domains during his 25 years guiding the Christian East as 270th Archbishop of Constantinople – itself a milestone since only three of his predecessors have served longer than 25 years. He has restored and promoted dialogue with Christian churches. He has traveled to Muslim countries never visit by Orthodox patriarchs. He has engaged political figures and organizations on vital challenges – like poverty and peace, minorities and migrants – and repeatedly affirming that the way to God lies through other people; there simply is no other way. Countless world leaders have sought out his wise counsel and global spiritual perspective, including politicians in the United States where he has met with every sitting president dating back to the Carter administration. Charismatic and personally charming, with openness and deep integrity, but also with compassion and iron determination, His All-Holiness Ecumenical Patriarch Bartholomew has silently, yet steadfastly proven “a truly ecumenical leader in every sense of this word” (Pope emeritus Benedict XVI) and “articulated a strong voice for all people and all creation” (Jane Goodall). Fr. 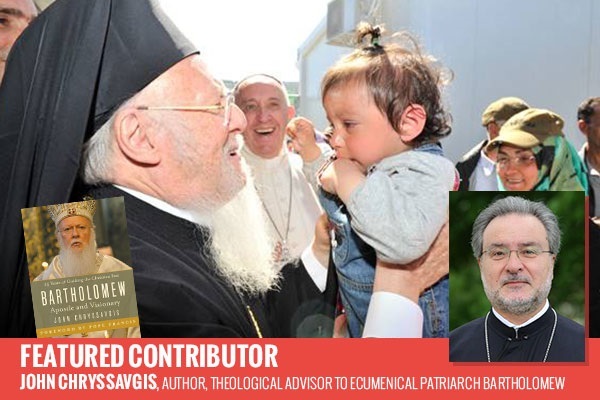 Dr. John Chryssavgis is an author and theologian serving as Archdeacon of the Ecumenical Patriarchate and theological advisor to the Ecumenical Patriarch. He is a clergyman of the Greek Orthodox Archdiocese of America. Born in Australia, he graduated from Athens University and Oxford University. His publications focus on medieval theology, as well as on the history of the Eastern Church. His interests embrace the areas of spirituality and ecology. He co-founded St Andrew’s Theological College in Sydney, where he also taught at the University of Sydney. In 1995, he was appointed Professor of Theology at Holy Cross School of Theology and directed the Religious Studies Program at Hellenic College. He has also taught at the University of Balamand in Lebanon. He has published over thirty books and numerous articles in several languages. He lives in Maine.